On the one hand it was a measure of just how crucial the motorsports industry is to the British economy. On the other, it gave rise to smirks all round from the more irreverent members of the F1 community. Still, I suppose it goes with the Prime Minister's badge. One minute you're trying to hunt down Osama Bin Laden, the next attempting to bash through anti-terrorist legislation - and the next being asked to help with assurances that the A43 upgraded Silverstone bypass will be ready in time for next year's British Grand Prix. On the face of it, you would have thought Tony Blair might have more pressing things to do. Still, with UK inflation now nicely under control, perhaps he had a few spare seconds. However, one is bound to agree with Mail on Sunday newspaper columnist Patrick Collins who wrote yesterday (17 December) that the government has better things to do with its money than back a sport which is dripping with money like F1. Unfortunately this column was framed as what amounted to a viritolic attack on Sir Jackie Stewart, accusing him indirectly of being "capable of spouting the most extraordinary tosh." This was in connection which is own tireless efforts behind the scenes to coax a degree of government support for Silverstone's efforts to upgrade itself to the exacting standards required by the sport's governing body. At the same time, Max Mosley and Bernie Ecclestone have both stated they don't think it would be appropriate to ask for public money in a business which should be able to look after its own future development and challenges. Bernie said; "We shouldn't be asking the government for money. 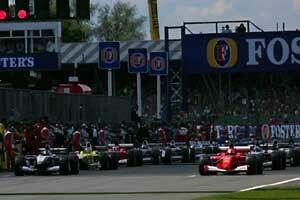 Silverstone has been a tip for far too long. As an Englishman, I've been very embarrassed by it all. It's a commercial thing and we have got to get it done ourselves." Collins then adds; "whereupon he pledged some £15m from his own pocket. An excellent example. I trust Sir Jackie will take note." Good old Bernie, I say. What a philanthropist. But hang on a minute. I suspect that £15 million is not actually a check written out on the spot. More like a reduction in the fee payable to his organization equating to that £15m and spread over several years. Still, that's only a detail. Bernie's dosh is very welcome - nay crucial - to the whole upgrading exercise. However, what I find slightly vexing is the way in which Stewart's efforts have been subtly put down during the course of this exercise. We all know Jackie can bang on like a one-man party political broadcast, but there are few people who've given so much to motor racing - and to charity, come to that - over the past 25 years than the wee Scot. He also paid his dues at the wheel at a time when motor racing was seriously dangerous and - together with Mosley and Ecclestone - has done more than his fair share to shape and secure environment in which today's generation of F1 stars operate. On another matter completely, I have heard it suggested that FIA president Mosley would not object to being ennobled, perhaps with a seat in the House of Lords, for his contribution to the sport in the UK. Frankly, I doubt it. Having known Max for more than 30 years - and particularly bearing in mind the somewhat eccentric and self-motivated background of the Mitford family from which he is descended - I can't imagine anything interesting him less. Mosley is a committed Europhile. If he seeks political advancement, it will be with the European parliament rather than the one at Westminster. And, in the end, I'll bet he achieves it.